Fei Li studies the “invisible car policies” that make cities dependent on cars. Photo courtesy of Fei Li. 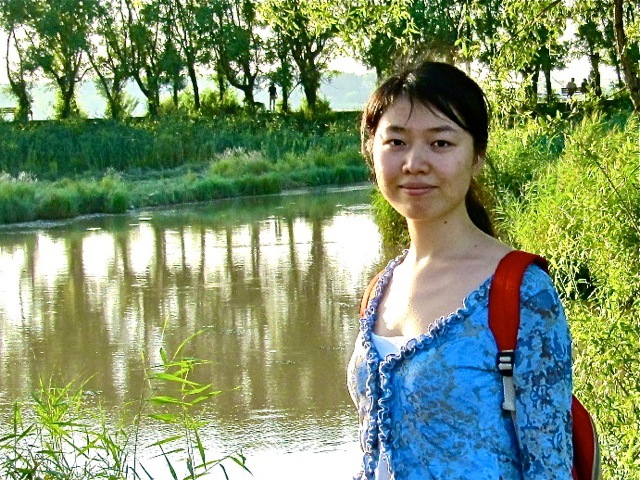 Fei Li is a Ph.D. candidate at New York University and a recipient of the 2013 Lee Schipper Memorial Scholarship. She researches, evaluates and challenges one of the most prevalent automobile-oriented planning policies around the globe: parking. A reform of the parking standard, which is often overlooked by planners and researchers, has the potential to deeply influence urban form and travel behavior. We spoke to Fei Li to learn a little more about how she got interested in urban planning and why the parking standard is so important. How did you become interested in urban design? What led you to study parking policy specifically? I’ve always been fascinated by the diversity of urban environments and how the environments in which we live can influence our daily lives. I hope that I can contribute to the making of sustainable urban environments and healthier lifestyles. Planning policies can influence how people and goods travel, and the right policies can encourage sustainable transport modes. Soon after I began my studies in the United States I started looking at parking policies, which have played an important role in shaping the car-centric cities that exist in the United States. What is a minimum parking standard exactly? Why do so many countries have them? A minimum parking standard is a law— a planning regulation— that requires buildings to provide a minimum number of on-site parking spaces. These regulations are widespread because of a fear that insufficient supply of off-street parking will lead to problematic competition for on-street parking. Indeed, the extra parking need generated by new developments, like new apartment buildings, often causes neighbors to oppose new, high-density developments. To avoid this conflict, developers are required to internalize the cost of parking and provide parking spaces for their own residents. What is potentially harmful about the minimum parking standard? Can you explain what an “invisible car policy” is? I refer to the minimum parking standard as an “invisible” car policy because it is put in place based on conventional practices or technical considerations, without the intention of encouraging car use or causing urban sprawl. But minimum parking standards are actually based on very pro-automobile assumptions and reasoning. The problem with the minimum parking standard is that it hides some of the costs of owning and driving a car. By bundling parking with housing or other types of development, the cost of parking is obscured. In reality, everyone who lives in or uses the development is automatically paying for the parking, even if they do not own a car. The provision for seemingly “free” parking distorts the cost of car usage, and can lead individuals to make uninformed choices about whether to own or drive a vehicle. Excessive parking requirements can also limit the ability for dense development, since parking spaces take up a significant share of developable land. This spurs low-density growth and urban sprawl, which in turn increases the need for automobile travel. What are some other “invisible” automobile policies that you have observed or read about during your work in this field? In the United States, there are often street design standards that include a requirement for on-street parking on most streets. Similar to off-street parking standards, it reduces the marginal cost of parking, distorts the parking market and imposes an implicit tax on non-drivers. As a Lee Schipper scholar, your work is a tribute to an out-of-the-box thinker who challenged the status quo. How does your research topic follow in his footsteps? As a student researcher interested in sustainable transport, I share Dr. Lee Schipper’s passion and I am inspired by his vision. My study calls attention to one of the most prevalent, long-standing car-centric planning policies across the world, which deeply influences urban form and travel behavior, yet is much neglected by urban planners and researchers. By evaluating the minimum parking standard and its potential alternative (maximum parking standard), the study aims to urge and facilitate the adoption of reformative parking policies in the United States. Why is it important to gather some empirical data on the issue of minimum parking standards? A big issue in parking studies has been the lack of relevant data. Existing studies on parking standards rarely rely on large datasets or quantitative analysis, and few have examined the linkage between parking standards and parking supply. As the first study to do both of these things, my project could provide valuable empirical evidence as well as a strong recommendation for reviewing and reforming existing parking policies. How does analysis of this policy affect developing countries? While the study is based in a Western context, the analysis of minimum and maximum parking standards is extremely relevant for developing countries, many of which are experiencing rapid growth in car ownership and parking demand today. Unfortunately, minimum parking standards have already become the norm in many developing countries. Luckily, some developing countries have already begun to use parking caps or on-street parking management schemes along with minimum parking requirements. A solid empirical analysis of the effect of parking standards will provide a useful reference for developing countries as they confront increased car ownership and growing populations. EMBARQ, the sustainable transport and urban planning program of the World Resources Institute, and the Lee Schipper Memorial Scholarship Board recently announced the 2013 recipients of the Lee Schipper Memorial Scholarship. The scholarship was established in 2012 to support the legacy of EMBARQ founder Lee Schipper’s in the fields of sustainable transport and energy efficiency. This year’s recipients are Sudhir Gota of Clean Air Asia and Fei Li, currently a Ph.D. candidate at New York University.